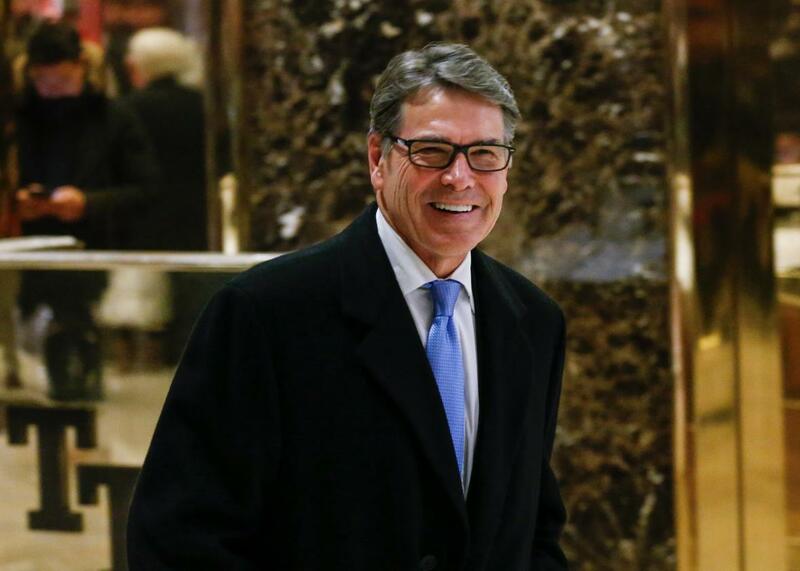 Rick Perry is Trump's energy secretary pick. Former Texas Gov. Rick Perry leaves after a meeting with President-elect Donald Trump at Trump Tower on Monday. As will be mentioned endlessly Tuesday, Rick Perry famously forgot to include the Department of Energy on his list of federal agencies to eliminate during a 2012 Republican primary debate. Perry, like Trump, has consistently denied the existence of climate change, although he hasn’t gone as far as suggesting the concept was invented by the Chinese to kill American manufacturing. “In his pre-campaign book, Fed Up!, Perry referred to efforts to tackle global warming as ‘hysteria’ and described the science a ‘contrived phony mess,’” Mother Jones’ Patrick Caldwell wrote last year. “He even wrote that ‘we have been experiencing a cooling trend.’ ” He’s the perfect pick, all and all, for an incoming administration bent on putting people in charge of agencies whose work they do not believe in. Perhaps to help him along in the great dismantling, the Trump team is already ominously compiling the names of Energy Department employees who have worked on climate change. Perry’s stances on climate change are sure to come up during confirmation hearings, as may his seat on the board of Energy Transfer Partners, whose subsidiary Dakota Access LLC is building the Dakota Access Pipeline. My fellow Republicans, beware of false prophets. Do not let itching ears be tickled by messengers who appeal to anger, division and resentment. Resentment is the poison we swallow that we hope harms another. My fellow Republicans, don’t take the poison. Rick Perry took the poison and endorsed Trump in May of this year; last July’s speech is no longer available on his otherwise still functional 2016 campaign website. Soon we’ll see Perry side by side with Trump again, reaping the rich rewards Trump’s America will continue to offer the most shameless and despicable people in American public life. Legend has it that Nero fiddled while Rome burned. The Romans didn’t know how good they had it. Come January, Rick Perry, incredulous at his own luck, will be practicing the sloppy moves he never mastered on Dancing With the Stars in a new office as all civilization slides closer to sweltering oblivion.